WASHINGTON D.C. (KTRE) - Mourners gathered Wednesday morning in Washington D.C. to bid farewell to former President George H.W. Bush during a memorial service. The 41st president died Friday. He was 94. The funeral service was held at Washington’s National Cathedral. Bush also shared wisdom his father imparted to him. “‘We cannot hope only to leave our children a bigger car, a bigger bank account. We must hope to give them a sense of what it means to be a loyal friend, a loving parent, a citizen who leaves his home, his neighborhood and town better than he found it,” he said. World envoys, including the king and queen of Jordan and Prince Charles, also were in attendance. The service capped three days of remembrance. More events, including a funeral service in Houston, are planned Thursday. After the service, Bush’s remain will be taken back to Houston. 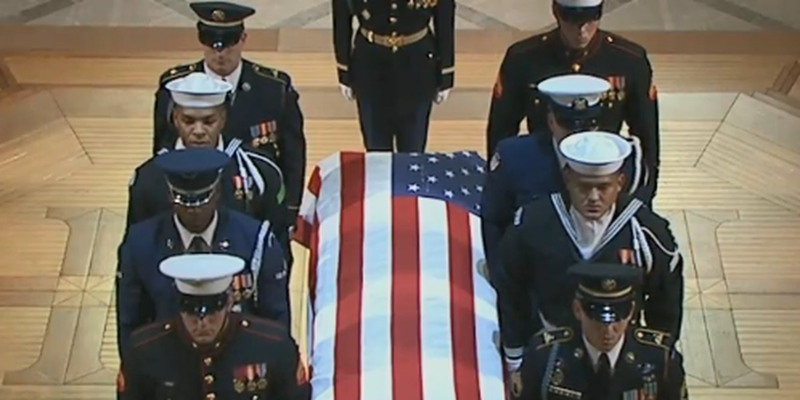 An arrival ceremony is scheduled for 5:45 p.m. at St. Martin’s Episcopal Church where Bush will lie in repose until his memorial service at 10 a.m. Thursday. Bush will be taken to Texas A&M University in College Station after the service where he will be interred a the George H.W. Bush Presidential Library & Museum. An article on the Texas A&M Today website states that the 89th Airlift Wing, which is based at Joint Base Andrews in Maryland, will conduct a tribute flight using an Air Force VC-25A in honor of Bush today at about 3:55 p.m.
Another post on the Texas A&M University Facebook page states that the U.S. Navy will perform a 21-aircraft “missing man formation” Thursday afternoon to honor Bush, who was a naval aviator during World War II. Dec. 5 was designated as a national day of mourning by President Trump in order to honor Bush. Federal government offices were closed today and flags on public buildings will fly at half-staff for 30 days.